Everyone who visits Ken's office is immediately confronted by two things: First is the smell of books... hundreds of them lining the walls from floor to ceiling. The second thing you notice is the wall on the left. It is jammed full of photos from 50 years of ministry. 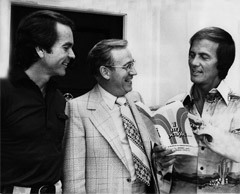 Family, friends, coworkers, celebrity guests, and studio photos line the wall, like this one of Ken with Dean Jones (left), and Pat Boone (right). Every time I visit Ken's office, I always stop and look at the pictures. You just can't help it. Now you can make a virtual visit to Ken's office...(except that you'll have to provide your own book smell!) I've taken some of the pictures and newspaper clippings on the wall and included them in this photo gallery. I've divided up the photos into two groups, general photos, and family pictures. The photos are NOT in chronological order. I wish I had a paragraph of information to explain each one, but the short description will have to do! I'd like to express my special appreciation to Jim Johnson who scanned in all the images and sent them to me! Thanks Jim! And of course, thanks to Carolyn for making all of the tapes, photos and other materials available!